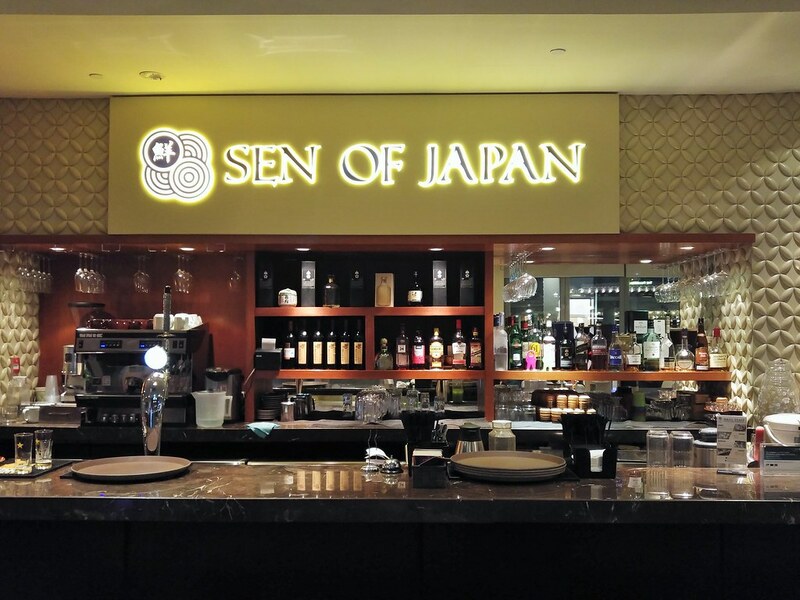 Sen of Japan is a casual dining Japanese restaurant and bar located at Level 1 of Marina Bay Sand Shoppes. 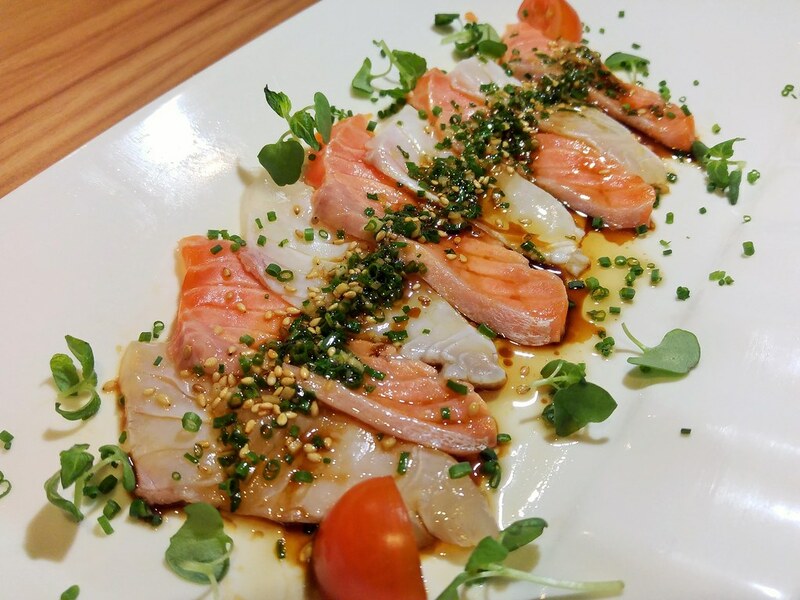 Their menu features modernised Japanese cuisine, crafted by Chef Nakano Hiromi who used to head the famous NOBU at the Hard Rock Hotel & Casino Las Vegas. 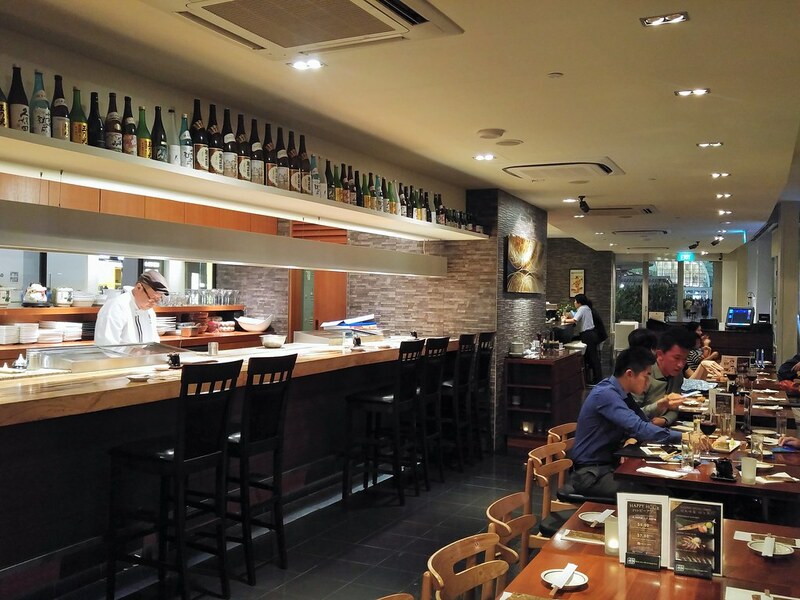 The elongated layout of the restaurant gives a fairly intimate setting and in particular, I like the long chef's counter that occupies the body of the restaurant. Housed in a semi glass structure, while waiting for the food, do take a while to look out and enjoy the world slowing down in the evening. 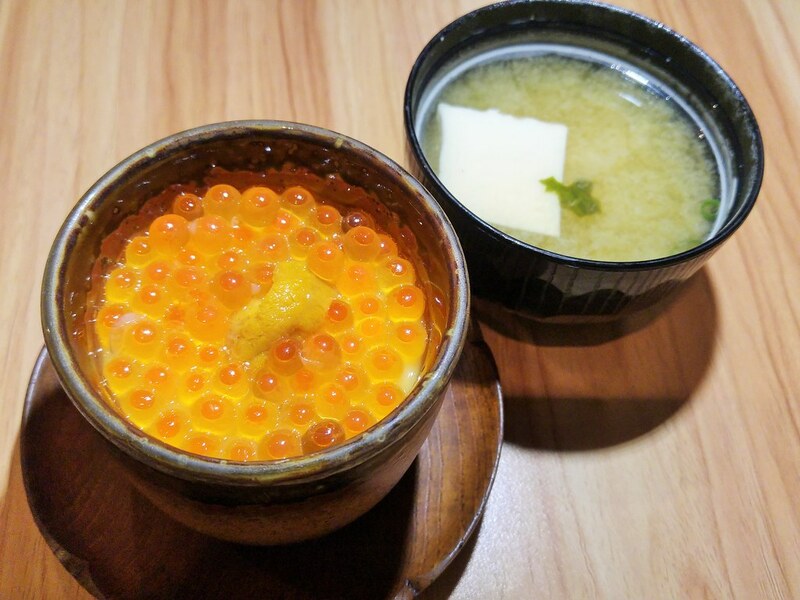 We started off with some warm dishes in the Ikura Uni Chawanmushi ($13) and House Miso Soup ($5.50). The Japanese egg custard adorned by the glistering salmon roe was beautiful. If you like roe, this is like popping ocean liqueur. The luxurious Uni was gone before I knew it, so do make an effort to slowly savour. I love the dash of truffle oil which releases a nice earthy aroma and flavour in the warmth. On hindsight, I should have ordered their Chawanmushi with shaved truffle instead as the taste of the fresh roe tend to overwhelm the mellow eggy flavour. 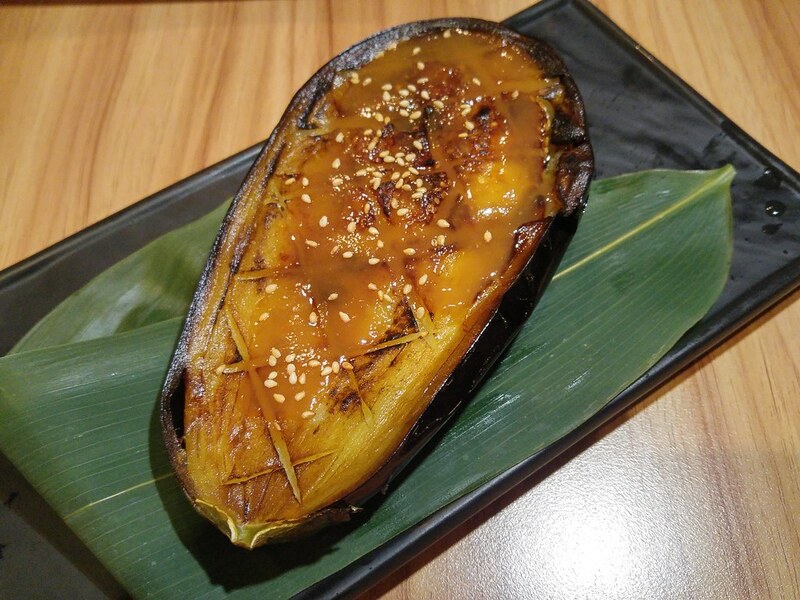 Their manager Ellie recommended us to try the Sweet Miso Eggplant ($9.50). 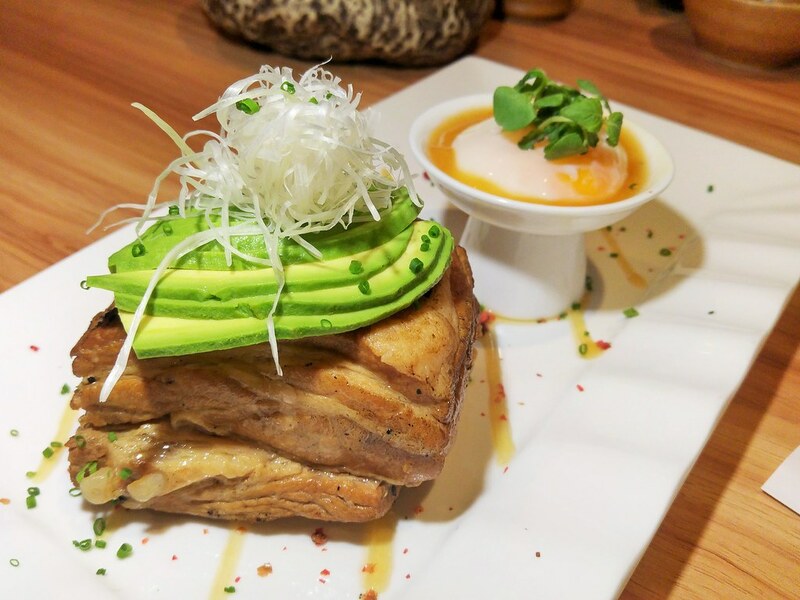 Sauteed and glazed with a layer of home-made miso, this humble dish is indeed not to be missed. The best portion is of course the charred parts. Together with the savoury-sweet flavour of the miso, they teased my taste buds in a illusive manner. Known as nasu dengaku in Japan, it's no wonder that this simple but yet delectable dish is one of their staples. As mentioned by Ellie, this is a very authentic dish but rarely available elsewhere. So you must really try it! Their raw bar special is good to go with any drinks. 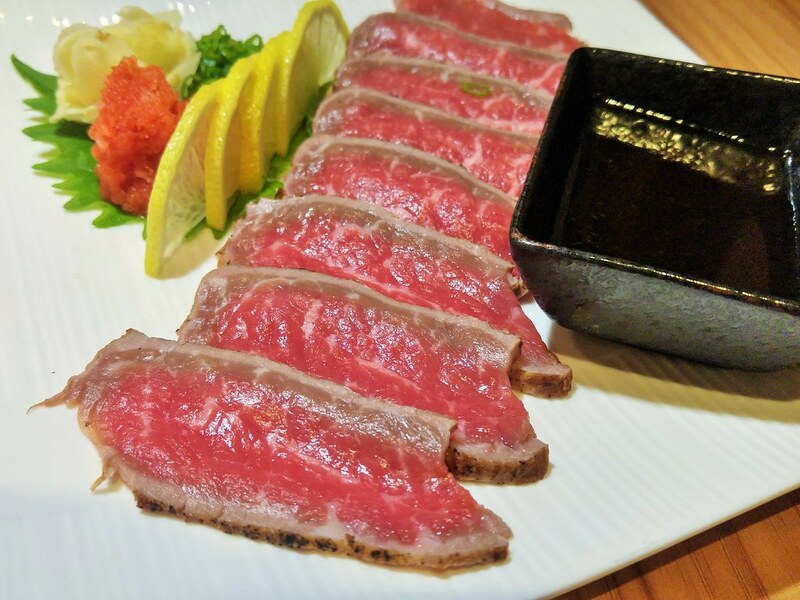 Wagyu Tataki ($18) showcases the clean and quick Japanese cooking that brings out the fresh flavours of the ingredients. The seared wagyu striploin though in very thin slices, was full bodied and meaty in my mouth. Likewise it is the same for their Special Carpaccio ($16.50). A quick sear with sesame olive oil seemed to have locked in the flavours and fats. Every piece had a deep, satisfying melt-in-your mouth texture. It released a fatty sweetness into my mouth which was neutralised by the tangy yuzu soy dressing. 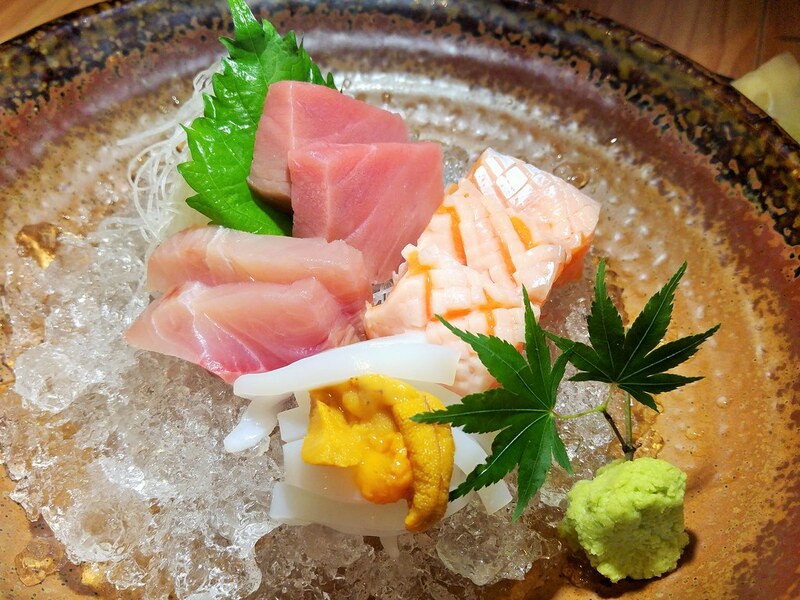 'Sen' in Japanese means 'Fresh', which they strongly believe the source of ingredients is the key of it. You can certainly taste that in their Sashimi platter 10 pcs ($42). 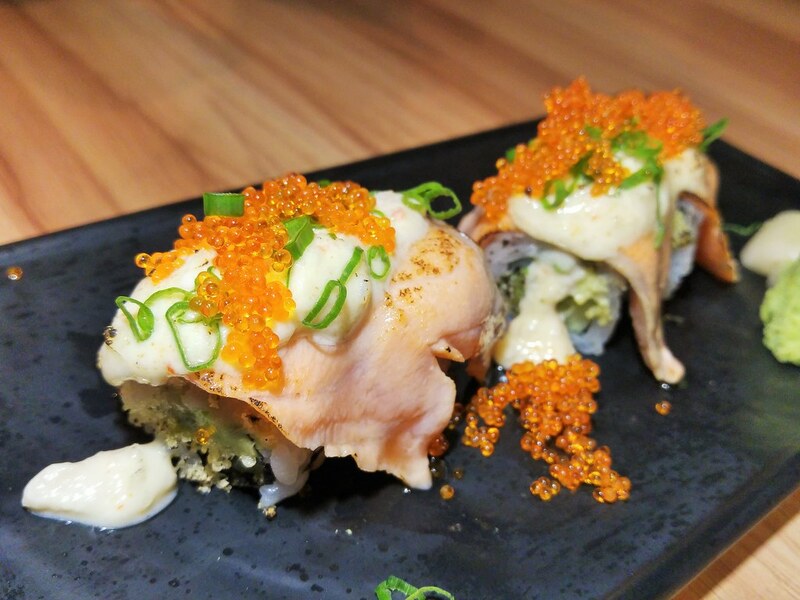 From the various social media posts, their Salmon Aburi Roll ($20.50) is apparently one of the most popular choices among diners. I tried it but it didn't wow me as much. It didn't disappoint with its melt-in-your-mouth sensation accentuated by their special cheese sauce. However, I wish I could taste more of the light avocado and the sweet, fatty salmon. Too rich a dressing seems to be an issue I have in most aburi salmon roll. What was surprisingly good was their Prawn Tempura, Salmon & Prawn Roll ($18.50), another brilliant recommendation from Ellie. It was a refreshing departure from the salmon aburi roll or any other rolls which I have tried. 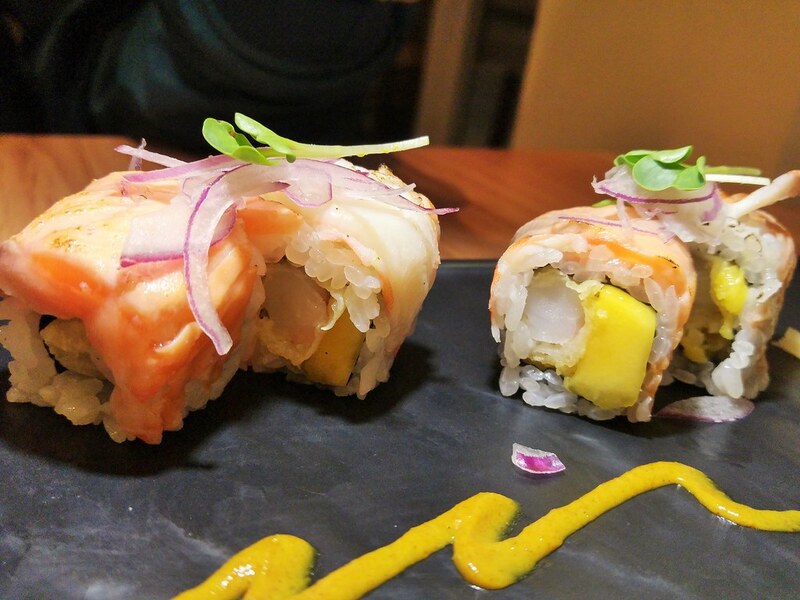 I could taste the crispy tempura, the sweet and crunchy prawn, juicy mango, as well as the fatty torched salmon. The heat lent from the spicy garlic ponzu sauce & curry sauce at the side enters with a right punch. For mains, their Braised Pork Belly ($29.50) looks so enticing on the menu that it made me forgo my favourite fish cheeks to give it a try. What a gorgeous piece of pork belly with visible define layers of fats and meat. Despite looking so sturdy and solid, the meat fell apart as the fork came down onto it. One taste of the juicy and flavourful meat glazed with the rich egg yolk was a bliss! Their Inaniwa ($16.50) is specially imported from Japan. 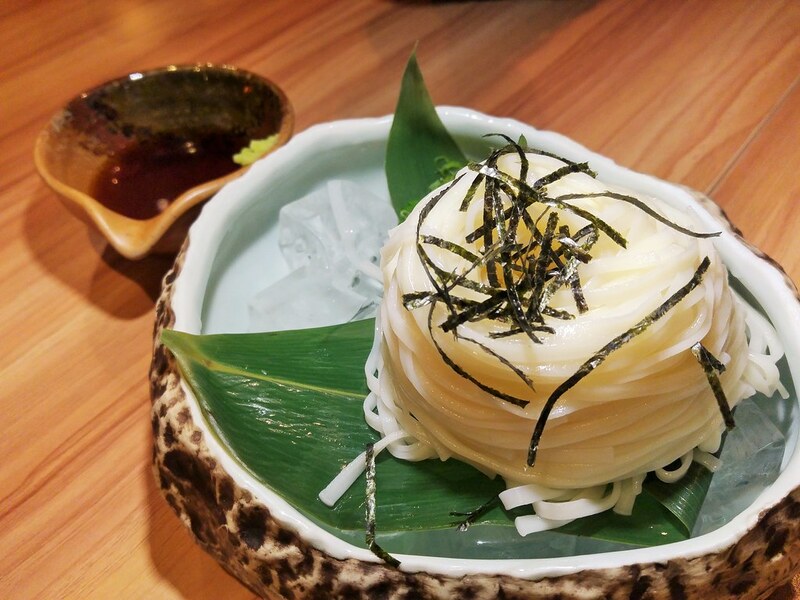 Silky smooth and refreshing, the handmade white noodles are eaten with the special dashi broth with soy. This is perfect for our summer climate. A variety of Japanese ice creams are available for desserts. 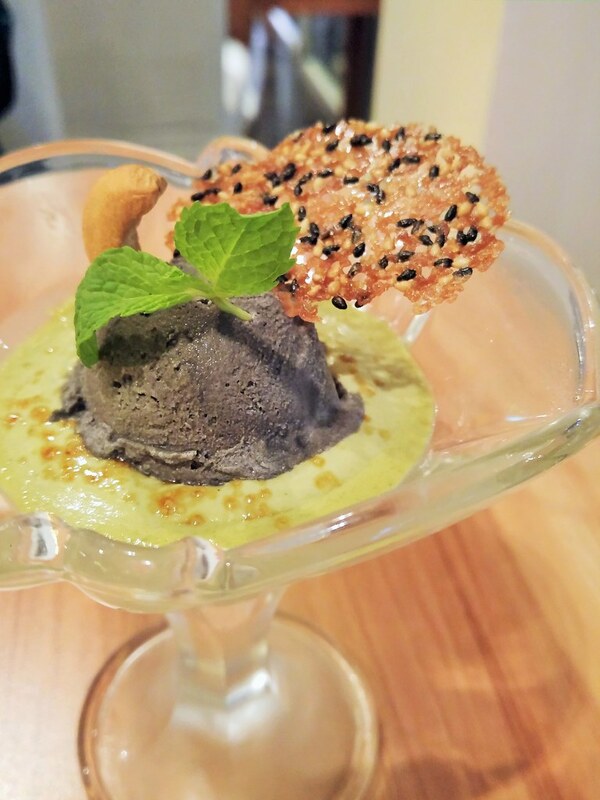 The most recommended is their Green Tea Brulee ($15) topped with black sesame ice cream. It is a combination of both very popular Japanese ingredients - matcha and black sesame. Creamy yet not cloying, the balance of flavours resembles a cup of well seeped tea. 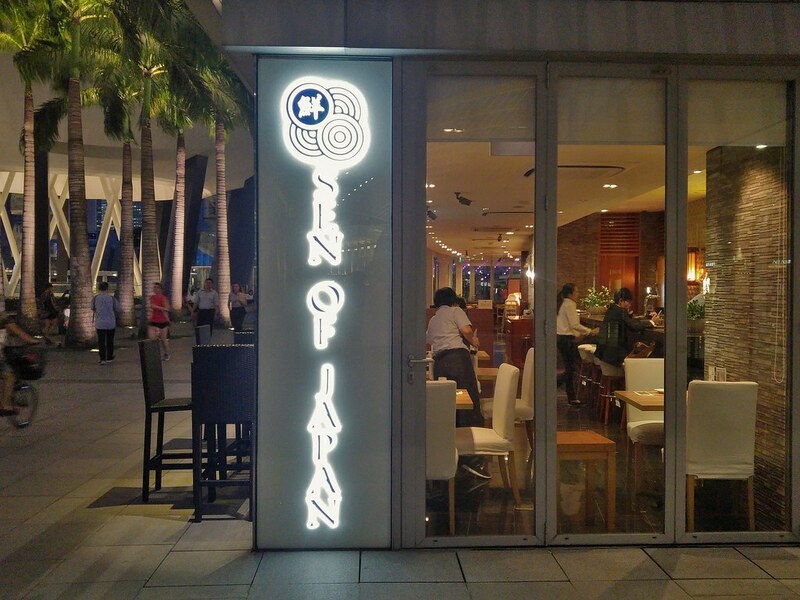 Among the F&B choices at Marina Bay Sands, Sen of Japan seems to stand out with an aura of zen-ness. I would love to sit at their chef's table someday!